The GREAT CREATE at Radio Shack is truly a well-intentioned and worthwhile exercise for getting kids interested in electronics and technology. It harkens back to the Radio Shack I new as a child where I could find all the bits and pieces for my projects. 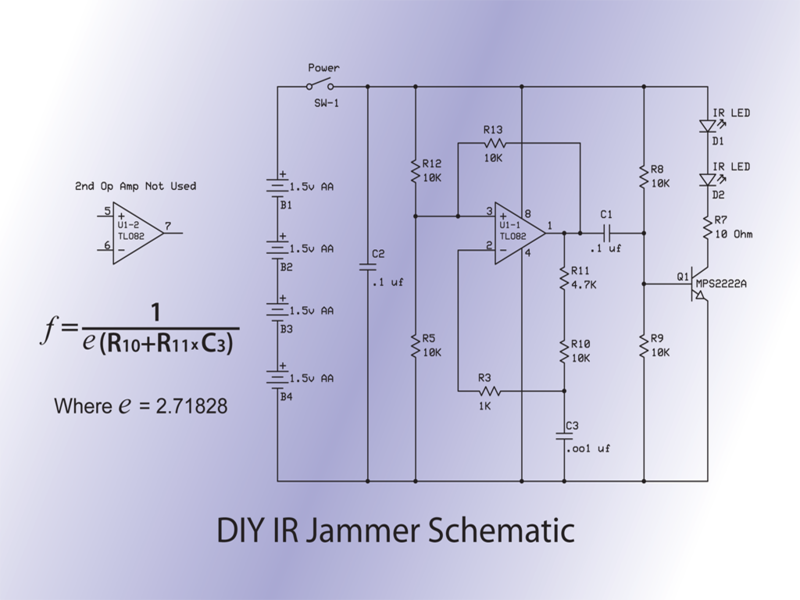 I found a brochure in the local Radio Shack that supposedly provided instructions on building a infrared remote jammer. I say supposedly because on closer inspection the brochure was filled with errors and missing information such that any kid trying to build it would have been met with disappointment and frustration. Projects like this done properly can be an inspiration that jumpstarts a career in science or engineering. Improperly presented they can turn a young mind away from a potentially great learning experience. With that in mind I posted the missing schematic and an explanation of how the circuit works, along with a spice simulation. The schematic breaks down into two major blocks with the first being a relaxation oscillator built around the TLO82 FET opamp, and the second being a current driver that uses the BJT transistor to convert the output of the oscillator into current drive for the infrared light emitting diodes. 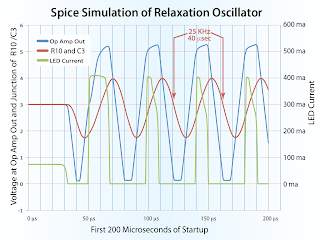 The relaxation oscillator works by using the opamp as a comparator. The charging and discharging of the RC network comprised of R11, R10, and C3 which is fed into the inverting input of the opamp causing the output to change states positive to negative every time the node of R10 and C3 reaches the 3 volt compare point set on the non inverting input. That 3 volt point is is set by the voltage divider R12 and R5. The diode driver works by AC coupling the signal out of the opamp through C1 directly into the base of the transistor. The resulting pulses drive the transistor from cutoff to near saturation. 10 ohm resistor R7 provides current limiting through the diodes. All of this can be demonstrated by viewing the graph I created using LT Spice. 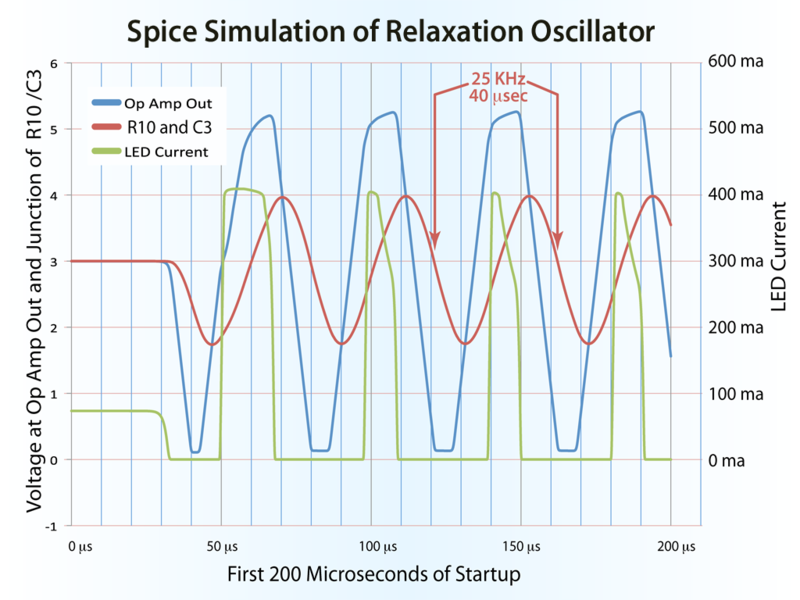 LT Spice is one of the best free programs available for simulating electronic circuits and can be found on Linear Technologies Web site. I highly recommend it. As for the simulation it shows the first 200 microseconds of the circuit, at which point it reaches steady state oscillation. This graph shows the RC circuit in red, the opamp output in blue, and the diode current in green. I may take time this weekend to build up the circuit to see if it works and matches the simulation. If I do there will be pictures. The two pictures of the circuit are rotated 90 degrees making it difficult to trace out. 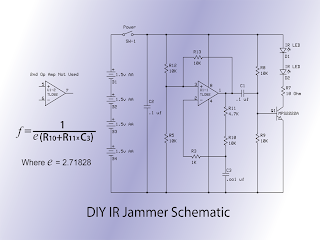 The shopping list is wrong and calls out only two 10k resistors, while the circuit requires 6 10 K resistors. No schematic or no link to a schematic. No explanation on how it works.